Updated 17:54PM, Sunday March 3rd, 2013	by Les Ellison, Christian.co.uk Be the first to comment! We’ve grown used to stories of dazzling new churches with huge followings, global media ministries and where founders and leaders become worldwide celebrities. Roy Godwin and Dave Roberts tell a different story. No glittering palace of worship here. No global media empire and no mega church congregation. Instead, this is the story of a converted farm, high up in the bleak but beautiful hills of West Wales, where God breaks through. 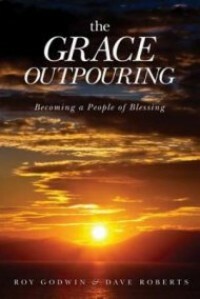 The Grace Outpouring is a simple story of hospitality and prayer: where all are made welcome and aware of God’s presence. There’s no story of building a congregation or even a resident community. Instead, the core vision is a scattered prayer community - The Caleb Community, pouring the grace and power of God outward into the world, rather than inward, into a church. The story begins with a sixth century Irish monk, Brynach, looking for a place of intercession and prayer for the local pagan and heathen community. Ffald-y-Brenin – ‘The King’s Sheepfold’ proved to be one of those ‘thin places’; a joining between heaven and earth where King’s flock could find safety and shelter. From the Welsh Revival years to the present, many others have found themselves written into the spiritual history of the unassuming retreat centre. The story of the current expression of new Celtic monasticism begins with a vision that seemed about to fail. 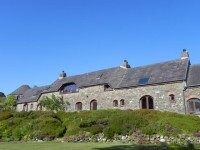 Then, in 1984, Phillida Mould and her mountaineer husband unexpectedly discovered the crumbling farmstead, establishing the Trust that would become the Ffald-y-Brenin house of prayer, salvation and wholeness. Most of all, the story of the Grace Outpouring is a story of stories; individual stories of men and women made whole and restored through their direct encounter with the love, grace and forgiveness offered freely to all pass through the Ffald-y-Brenin’s door - for a few days or just a few hours. It’s clear from the stories of the Grace Outpouring that Ffald-y-Brenin is a centre to move out from rather than move into. Location is important to the work of Ffald-y-Brenin – or the work of God through Ffald-y-Brenin. One of many stories recounts the experience of a young Australian woman with Welsh family roots. Her Welsh grandfather had been a miner and drunkard keeping the family in a constant state of fear and financial desperation. She despised her grandfather and her land of origin. Modestly told, the authors make no great claims for themselves or their achievements. It’s a humbling story that the mega-church leaders and followers would do to read; which might be why the book is written with American style English and grammar. It is a surprisingly well written and readable book that deserves to be widely read.